Minister of Health and sanitation has stated that pharmacists in the West African sub-region, especially in Sierra Leone, were critical to the health of the people they serve. Dr. Alpha Tejan Wurie was speaking yesterday at the Freetown International Conference Centre during the official opening of the 31st Annual General Meeting and Scientific Symposium of the West African Postgraduate College of Pharmacists on the theme: “A paradigm shift in pharmacy education”. “You should be robust in ensuring that our people are served well irrespective of where they are. You are critical to the health of the people of our various countries,” Dr. Wurie said. He said there are a number of pharmacists in the Pharmacy Board of Sierra Leone but unfortunately, quality pharmacists that should serve in peripheral health centres were absent. According to him, pharmacists continue to remain on the same grade even though they would have acquired their masters and doctorate degrees, and urged fellows of the college to advocate on behalf of their colleagues. He called for the strengthening of laboratories as most of national laboratories were not accredited institutions but yet still, they talked about fake and substandard drugs. He added that the continent has now become the dumping ground for Asia as all substandard drugs are brought to Africa, especially West Africa. The health minister noted that what Liberia and Sierra Leone went through during the Ebola crisis was an indictment on the health systems, as medical personnel were afraid to serve but said the scourge created a window of opportunity as Sierra Leone was now in the position to respond to any epidemic that may occur. “It is now clear that we cannot be able to develop as a continent without a science and technology base as they constitute the bedrock of development,” he noted. Earlier, President of the college, Professor Emeritus Sir Kwame Sarpong, noted that the meeting was to begin a process of stock taking of the activities and performance of the college over the past year. He said in October 1976 in Monrovia, Liberia, the West African Pharmaceutical Federation was formally inaugurated because pharmacists in the region realised the need to come together to harmonise and develop pharmacy education, laws and practice in order to improve the quality of healthcare. “In the process of realising our vision, we recognised the need to establish a postgraduate professional training programme leading to fellowship award in order to meet the expanding roles of pharmacists worldwide. In 1991, the college was established under the educational mandate of WAPF,” he stated. He disclosed that the college admitted its first batch of fellows by examination in February 1997 and that to date, a total of 1,500 have been graduated as fellows. 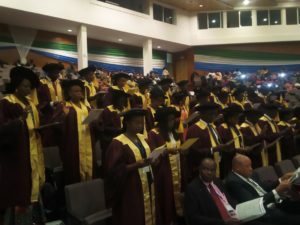 Professor Sarpong congratulated the newly 118 graduated fellows and urged them to go to the field and demonstrated the knowledge and professional prowess they have acquired.